With a birthday just a month before Christmas my wish list is always quite long and over the top with the motto, if I don't get it for my birthday it can go on my Christmas list. Since spending a fortune in America and treating myself very well I don't need or want so many things this year but there's still a few expensive things that I'd absolutely love. I've cheated slightly and know that I'll be getting a Michael Kors watch and Tiffany's bracelet because these were both bought in America. In fact I bought the watch and my Mum paid me back... but it might not be for my birthday! The big gift I'd love to receive, as I can't quite justify buying it for myself, is a new camera. Originally I wanted a DSLR but with a lot a research I quickly discovered that a compact system camera would suit me better. With help from friends, google and youtube I finally decided on the Samsung NX300. The Origins Face Mask set from Boots looks fantastic and when I spotted it for half price recently I quickly sent a link to my brother so fingers crossed he noticed! Models Own has recently been adding to Superdrug's selection of nail products and this set of 10 HyperGel polishes has beautiful colours and would update my collection just nicely. You can never go wrong with Benefit products and They're Real Push Up Liner is one of my favourite Benefit products just now. My Pandora bracelet has been one of my favourite pieces of jewellery since getting it for my 21st birthday and it's about time I got a safety chain for it so I'm keeping my fingers crossed for one this birthday. 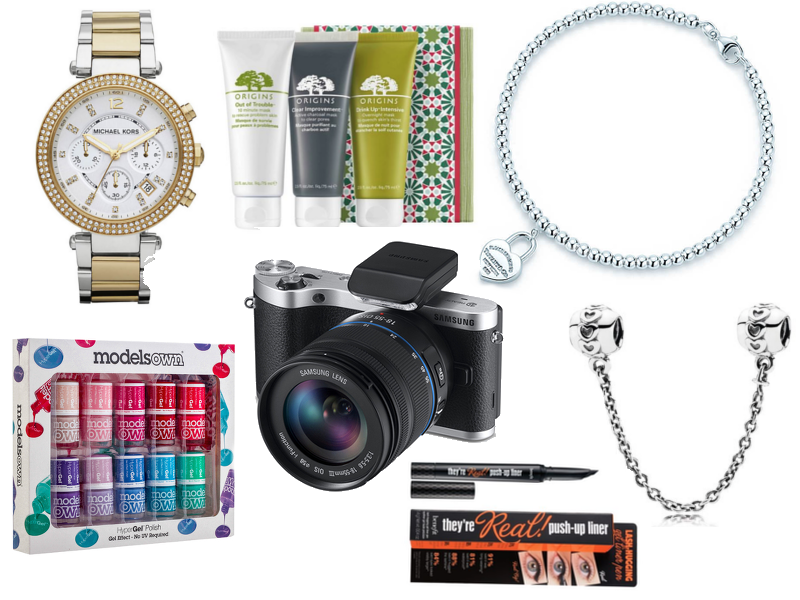 Are any of these things on your birthday/Christmas wish lists?